Negan's been a pretty polarizing figure in The Walking Dead comic series ever since he debuted in the book's 100th issue — some fans of Robert Kirkman's epic have enjoyed the psychopath's sense of theatrics and colorful use of profanity, others have pigeonholed the Saviors' leader as a cheap Governor knock-off. But no matter what you think of Negan, he's had a fairly large impact on the overall Walking Dead comic story, so it's probably no surprise that Kirkman is now letting fans of "The Walking Dead" TV series know that a Negan appearance is a virtual certainty. In an interview with MTV News — picked up by Crave site Comic Book Movie, the series creator and TV executive producer mused about who would play Negan (Jon Hamm got the nod from the interviewer, Kirkman was more non-committal), then addressed the Negan question pretty head-on. 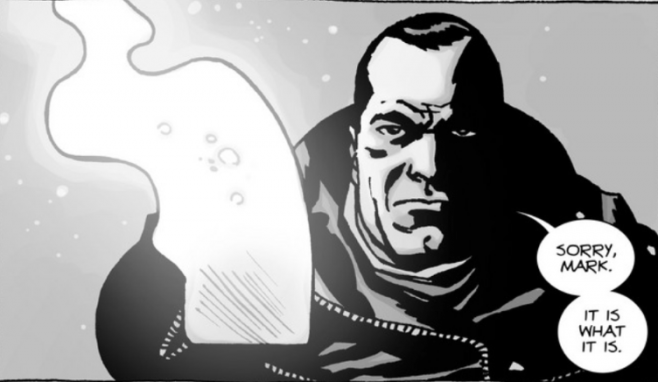 "I wouldn't expect Negan too terribly soon, although he is definitely in the plan. It's a 99% lock that he's going to be in the show eventually, so be on the lookout for that." So while we probably shouldn't expect Negan to show up when the fifth season premieres in October, keep your eyes peeled down the road for a big dude with a gnarly baseball bat…and watch your back, Glenn.